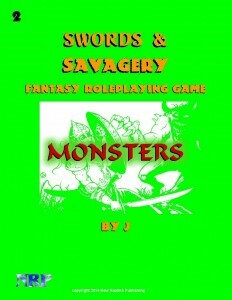 New Realms Publishing now has their Monsters book for Swords and Savagery available online. Add some monstrous mayhem to your Swords and Savagery games with Monsters. Monsters brings you complete stats and descriptions for over fifty monsters, over forty new special abilities and more! With Monsters you can design adventures and deadly encounters to challenge the adventurers in your Swords and Savagery games. In addition, you can use Monsters along with Universal Adventures Dungeon Deck, Encounter Deck, Wilderness Deck and other products from the Universal Adventures line, to quickly create adventures before, or while, you play or to play solo. Design adventures and encounters, play solo and more with Swords and Savagery, Swords and Savagery Monsters and Universal Adventures!